Large fully renovated 4/5 bedroom country house with small adjoining house for renovation, set in land of around 3200m2. 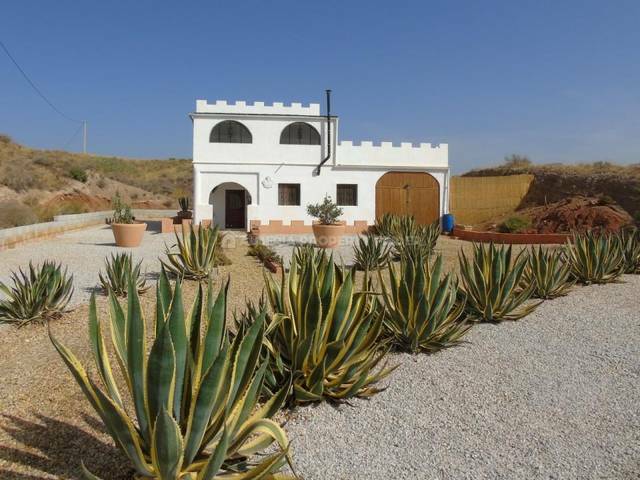 This spacious two storey property for sale in Almeria Province is situated in a small hamlet around 10 minutes drive from the large town of Albox which offers all amenities. From a large graveled parking area, stairs lead down to the front door which opens into a good sized dining room. From here, an archway leads through to a fully fitted kitchen with feature arched ceiling and a door leading out to a lovely walled patio. To the other side of the kitchen, an arch leads into the lounge which has an electric fire. To one end of the lounge, a door leads through to a hallway with an external door and steps lead up to a room which could be used as a 5th bedroom. Also on the ground floor is a bathroom comprising full size bath, large glazed shower cubicle, WC and basin. Stairs from the kitchen lead up to a landing area on the first floor, giving access to four bedrooms. The spacious master bedroom benefits from a walk-in wardrobe and a Jack & Jill style ensuite which is shared with the adjoining bedroom. The bathroom comprises a full size bath, corner shower, WC and basin. Two of the bedrooms have fitted wardrobes and one also has patio doors leading out to a large terrace with access to the parking area. Adjoining the main house is a single storey property in a ruinous condition. 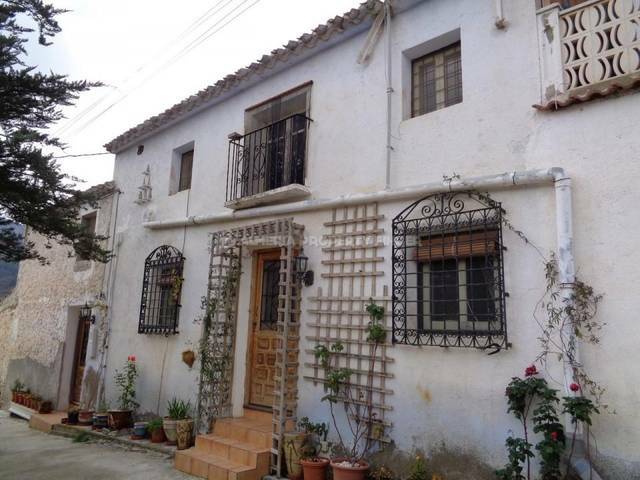 It is in need of complete renovation including a new roof, and could become a 2 bedroom guest house, ideal for extended family or to create a rental income. Alternatively it could be knocked down to create additional garden space. The property is set in a flat area of land which has been landscaped and laid with a combination of tiles, paving, artificial grass and gravel. There are various seating areas from which to enjoy the stunning views across the valley. The remaining land is hillside scrubland.